While it’s no news that having a college education can bring in higher wages, a new study shows that continued education may make you more likely to become a homeowner by age 30. Recent findings from the Federal Reserve Bank of New York show that those with an education level of bachelor’s degree or higher are more likely to own a home by 30—regardless of their student debt situation. Earlier studies have repeatedly shown that student debt impacts the homeownership rate, so this new information is positive for hopeful would-be homeowners who feel buried under their student loans. The study focused on those born between 1980 and 1986, and tracked their college attendance and homeownership rate by age. The study measured college attendance by entry into higher education by age 26 and defined student borrowers as those having any student debt at any point between ages 27 and 30. The study defined “homeownership” as having a mortgage at any time prior to age 30—an age that was normal in previous generations but has become less likely with the millennial generation. 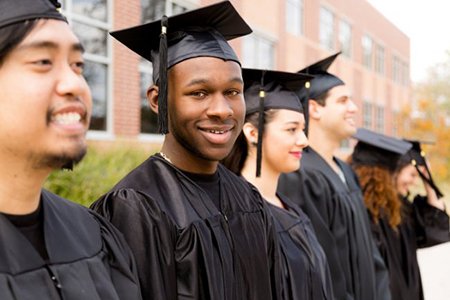 The study found that college graduation, measured by highest degree attained, is undoubtedly associated with higher homeownership rates, regardless of debt status. According to findings, among both graduates and non-graduates, those with student debt are again less likely to be homeowners (by age 30). The study found that by age 33, the homeownership rate for those who did not attend college is about two years behind that of those who attended college with debt but did not graduate. Oddly, the study found that those who enter associate programs, accumulate debt, and then fail to graduate still own homes at a slightly lower rate than those who do not go to college at all (before age 30). After age 30, the two rates converge. But is the amount of student debt related to levels of homeownership? The answer is yes. According to the study, those holding more than $25,000 of debt are less likely to own homes than those with smaller debt numbers. Information provided by Rajashri Chakrabarti, Nicole Gorton and Wilbert van der Klaauw, “Diplomas to Doorsteps: Education, Student Debt, and Homeownership,” Federal Reserve Bank of New York/Liberty Street Economics (blog), April 3, 2017.